A nasopharyngoscopy is a procedure in which the doctor inserts a flexible scope tube through your nose and advances it into the back of your throat. What can the doctor see? The doctor can view the back of your nose and down your throat to your larynx (voice box). What should you know about this procedure? The doctor will spray a local anesthetic to numb your nasal cavity. The scope will then be inserted through your nose and advanced slowly down the back of your throat. Pictures may be taken through the scope. The procedure usually takes 2-4 minutes. The scope will be removed and you should not feel any further discomfort. Your throat may be numb from the anesthetic for an additional 20 minutes. Do not eat for an hour after the procedure. What is a nasal endoscopy? Nasal endoscopy is a procedure in which the doctor can look directly through the fiber-optic tube called an endoscope. How it works? Patients tolerate nasal endoscopy very well. A topical nasal decongestant and numbing medicine is applied by a nasal spray prior to endoscopy. Often, the examination can be completed without any special medicines at all. Once the endoscope is removed, you may return to most normal activities immediately. You should refrain from eating or drinking until your gag reflex returns. What can the doctor see? 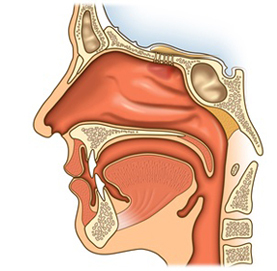 The doctor can look into the nasal passages, larynx, pharynx, and other surrounding structures to help diagnose or delineate problems such as nasal polyps, nasal blockage, recurrent sinusitis, or laryngeal trauma. Description Laryngoscopy is a procedure used to see the back of the throat, where the voice box (larynx) containing the vocal cords is located. Laryngoscopy is an effective procedure for discovering the causes of voice and breathing problems, throat or ear pain, difficulty in swallowing, narrowing of the throat (strictures or stenosis), and airway blockages. It also can help diagnose problems in the vocal cords.